This exercise is actually like finding a metaphor for your perfect life… the life you would be living if you did everything right. I’m not talking about beating up on yourself; I’m talking about that feeling of satisfaction you get from knowing you are doing things well. Remember the sitcom Cheers?? Now, I’m really dating myself. I was already in graduate school when Cheers was popular. hmmh??! Anyway, Cheers is an actual bar in Boston, famous for its at-home atmosphere. 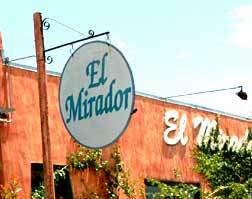 That’s what El Mirador is like. Everybody knows your name. And, if you are a regular like Uncle Ernie and I are, they come out and visit with you on the patio and do special things like bring you a cushion to sit on. And you have your own waiter, regardless of what section you are sitting in. My goal as a hypnotist is to be as good as my favorite restaurant. So what is it about your favorite restaurant that appeals to you, and how can you incorporate it into your vision of your perfect self?